With RAM-KIL on the scene, you can rest assured that we only use the very best products that are on the market today! Upon our inspection we will identify which is best for you. If you have termites we will use a liquid treatment (Termidor) to immediately knock down the termite activity and then we will install a termite baiting system that will continue to eliminate new colonies for as long as you have the system in place! We don't mess around with these house destroyers! The typical termite nymph, look like pale or white ants, with a thicker waist and straight antenna. These are the cycle which many people identify as what a termite is ‘supposed’ to look like. Swarming termites look like a colony of flying ants. When they settle, they often shed their wings. 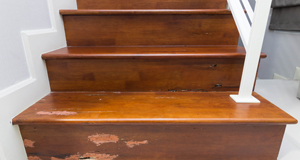 Dark areas or blisters in your wood flooring can often be a sign of termites feeding within the wood or below. Hollowed wood will usually have a honeycomb-like interior and a hollow, empty sound when knocked on. 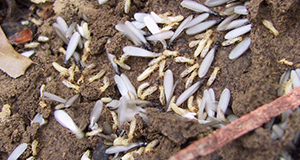 After swarming, termites will often leave behind their discarded wings. You may also find several black or brown dead termites. Termite mud tubes are about the width of a drinking straw and connect termites to their food source. Mounds of small pellets that resemble dark sawdust or coffee grounds can indicate the presence of termite waste. Can you DIY and spray for termites yourself? Spraying and treatment for termites involves the use of highly restricted pesticides, most of which are not available to the average homeowner. For this reason, a DIY termite treatment may only be met with limited success. 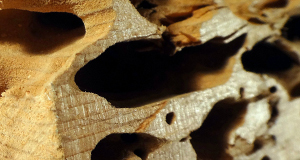 Our termite inspection process involves the careful scrutiny of the home for signs of termite activity, including wings, mud tubes, droppings (frass) and structural damage such as bubbling paint or soft spots.